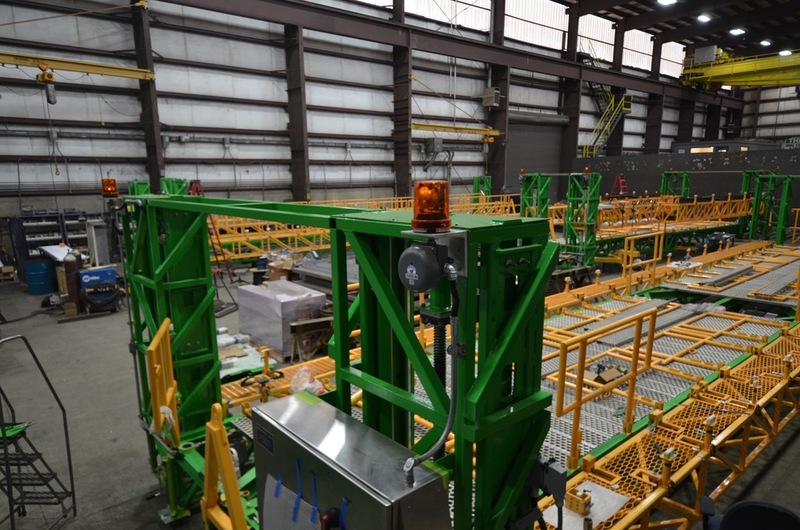 Featured project: Aircraft tooling and transportation package — ABW Technologies, Inc. Create a turn-key, custom tooling and transportation equipment package with PLC control for a major aircraft manufacturer. In addition to our fabrication work, we provided value-added design throughout the build of this approximately 60’ L x 14’ W x 10’ H transportation tool. The tube structure required us to weld the deck with a built-in camber in order for it to be flat within drawing tolerances when supported by four castors. Additionally, the two 59’ lifting trusses required a built-in camber to maintain the designed tooling support. The overall bearing support tolerances were held to within +/- .010 over a span of 57 feet, and all tooling locating fixtures we held to a true position of .030 in x, y, and Z. The final product weighed 22,000 lbs. We executed all the fabrication, coating, mechanical drive installation, assembly and electrical controls system at our facility here in Arlington.